Still a sleeping beauty, the nine islands of this fascinating archipelago, which marks the westernmost end of Europe, have everything to please the discerning traveller! If you are in search of spectacular landscapes with never-ending panoramic views; savagely beautiful untouched nature; wide open spaces where the colour green in a myriad of shades prevails; exuberant flora exhibiting all colours of the rainbow, with hydrangeas, agapanthuses and azaleas in abundance; solitary hiking routes; small, peaceful villages; picturesque and deserted roads, idyllic coves and unspoilt beaches … then the Azores are the ideal holiday destination for you! Yet, the Azores are not only virgin nature galore, the archipelago also boasts a fascinating history - due to its strategic position in the North-Atlantic, in the triangle with the three continents Europe, America and Africa - a fact, which left the Azores with a rich cultural heritage and unique traditions for everybody interested to explore! 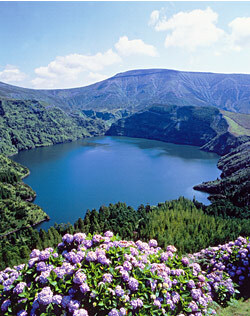 You choose the Azores for your next holiday destination and you will be guaranteed tranquillity and serenity, soothing colours, stimulating aromas, crystal-clear waters, a moderate climate, security and a genuine hospitality… in short, everything for a unique and incredibly revitalising holiday… you will probably want to experience over and over again! 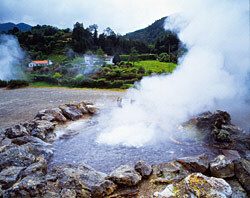 Come and discover the Azores with us! See this space throughout the site for special insider tips, notes and observations about the island.